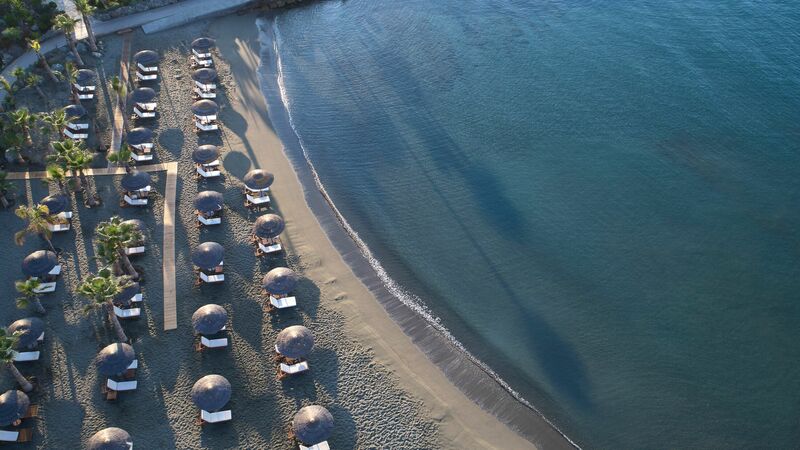 Amathus Beach Hotel Limassol is a luxurious property set right on the golden sands of the beach. It offers a wealth of facilities and experiences, with something to keep guests of every age relaxed. Enjoy romantic candlelit dining beneath the stars or head to the spa where you can choose the hotel’s signature package and leave feeling rejuvenated. Each of the rooms is bright and modern with attention paid to every detail. 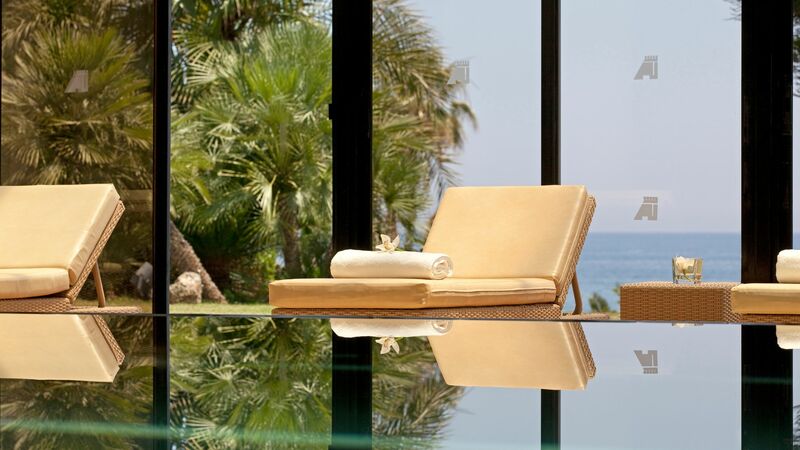 Choose from views of the Mediterranean or the beautiful gardens, as well as private swimming pools and more. There are 10 restaurants and bars to choose from, each with their own flavour and atmosphere, as well as two swimming pools and two beaches. Hotel child prices apply to ages 2–14 years. The hotel has 239 rooms, 5 floors, and 3 lifts. Specially modified rooms for people with reduced mobility are available on request. 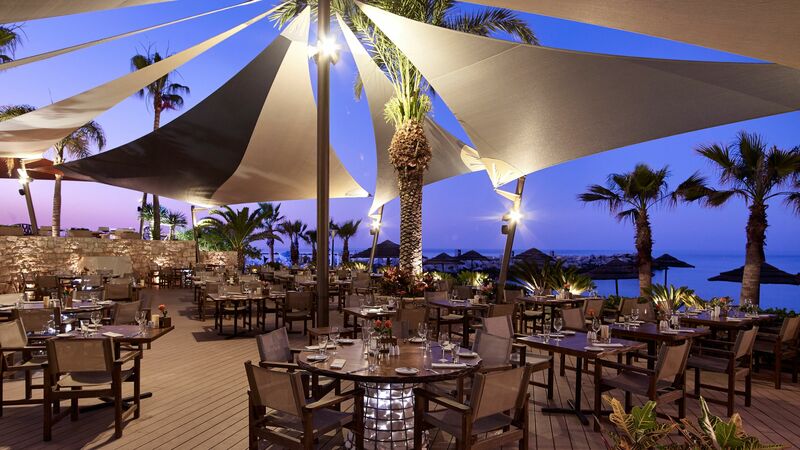 Guests of the Amathus Beach Hotel can pre-purchase Dine Around vouchers that allow guests to dine in a range of a la carte restaurants at the Amathus Beach and neighbouring Four Seasons Hotel. Dine around must be pre-purchased before travel in groups of 3, 5 or 7 vouchers per person and a purchase of 5 or 7 vouchers will also include one complimentary lunch buffet. 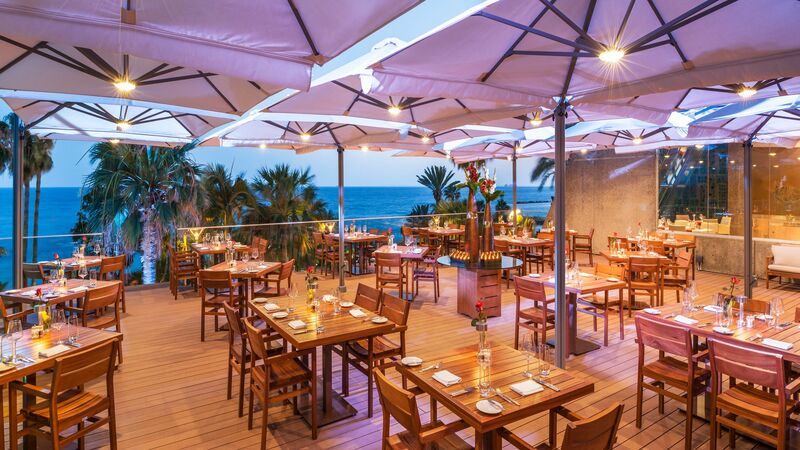 Dine Around vouchers can be used for a 3 course dinner or a set tasting menu (depending on restaurant) at Limanaki Fish Restaurant and the Grill Room at the Amathus Beach Hotel or at Vivaldi by Mavrommatis Restaurant, Seasons Oriental and the Seafood Bar at the Four Seasons Hotel. Please call our Trusted Advisers for more information. This al fresco terrace is the perfect place to enjoy fresh cocktails, snacks and light bites as you overlook the hotel gardens leading down to the Mediterranean. There is also an indoor area for those wanting some shade. 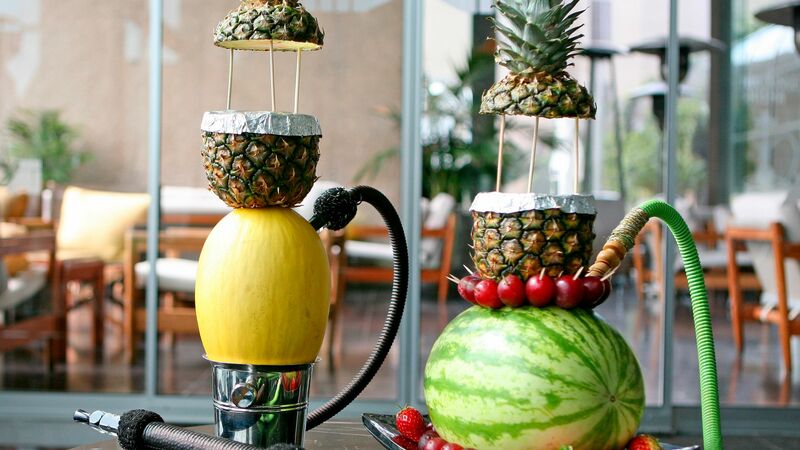 Choose from a menu of cocktails, snacks and over 50 flavours of shisha as you enjoy panoramic views of the sea. The lounge is perfect for a relaxing afternoon or an evening listening to chilled tunes. Choose from snacks, refreshments and light bites at this outdoor bar. The menu includes fresh juices, waffles, ice creams, hot and cold sandwiches, sushi and lots more. 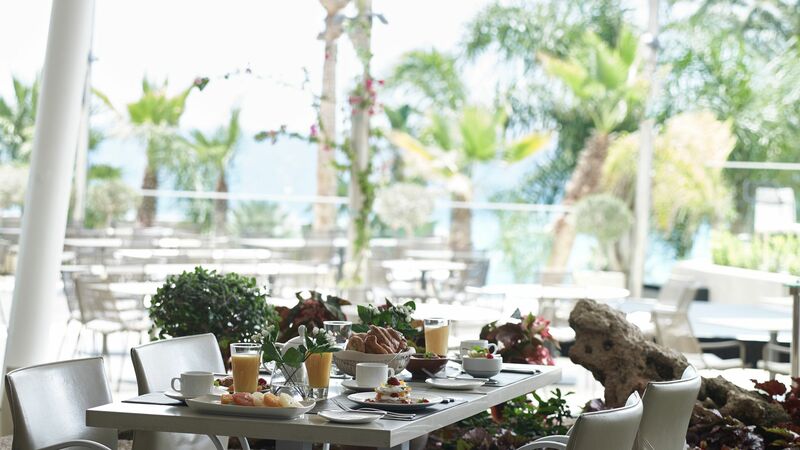 Enjoy all day breakfast, lunch and snacks on the terrace or in the elegant restaurant. Choose from Middle Eastern, Cypriot, Italian, Indian and Chinese flavours. The grilled prawns, fresh pasta, steak and chocolate cake are a must. Half Board guests can enjoy breakfast and lunch or dinner in the restaurant. Dine on the al fresco terrace and enjoy the shade from the surrounding palm trees as you overlook the ocean. The themed buffet changes regularly, with the traditional Cypriot evening highly recommended. Half board and full board guests can enjoy dinner here. A relaxed, beachy feel matches the views of the ocean as you order creative cocktails, champagne, wines and more alongside freshly cooked fish, fresh oysters and a delicious cheese board. 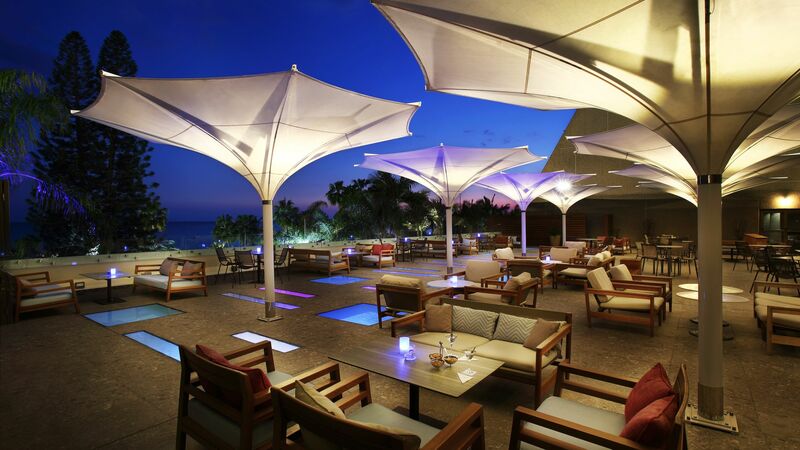 Dine beneath the stars as you listen to the waves lapping the ocean. Enjoy a selection of freshly caught local seafood, including prawns, calamari, crab cakes, oysters, lobster and more. Full board guests can choose Limanaki Fish Lounge as their dinner restaurant. Half board guests are entitled to a food allowance of €17.50 per adult and €9.75 per child for dinner. 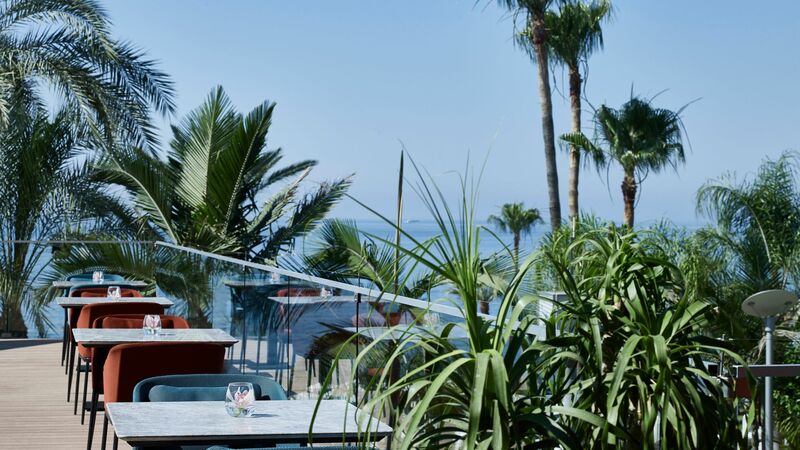 Relax and take in the views of the Amathus Beach Hotel Limassol’s gardens as you choose from exotic cocktails and a shisha menu with 50 different flavours available. Take in views of the hotel’s marina in the chic and elegant restaurant interiors. 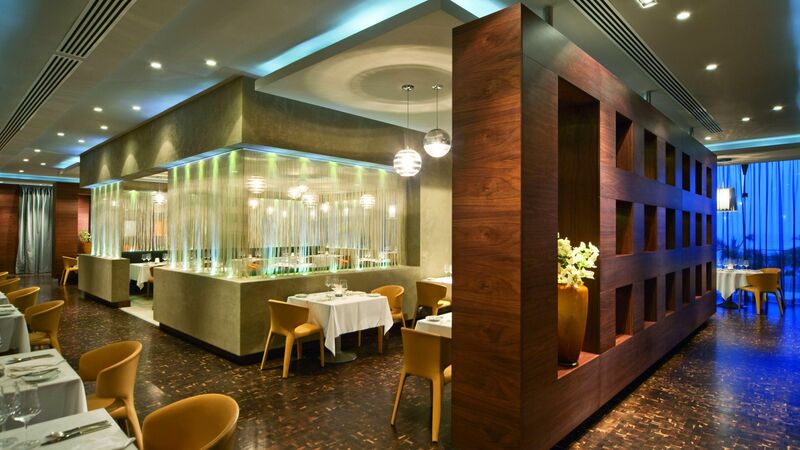 Fine dining and wines are expertly paired by the hotel’s chefs. The Cyan is open to full and half board guests for dinner during the winter. Take in views of the sea from the large windows or wooden al fresco deck as you enjoy a romantic meal of locally sourced produce. The smoked salmon is a must, as well as salads, succulent beef and more. Full board guests can choose dinner here. Half board guests are entitled to a food allowance of €17.50 per adult and €9.75 per child for dinner. Children under the age of 5 are not allowed in this restaurant. There are two private beaches to choose from during your stay, with one dedicated to families. Each is fully equipped with sun loungers and parasols. There are two outdoor swimming pools, one of which is dedicated to families. Play on the waterslides and let little ones paddle in the shallow end. There is also a heated saltwater pool indoors. 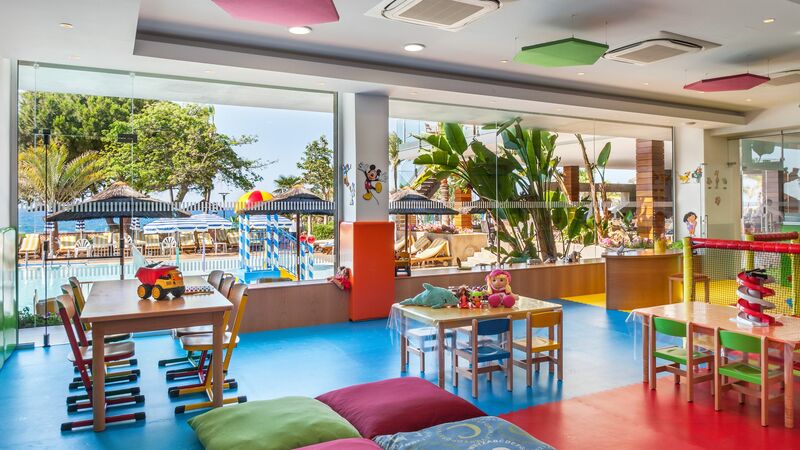 This complimentary kids’ club offers a full programme of activities and games with expert staff on hand. Activities include cooking lessons, a cinema, arts and crafts, TV games and a soft play area. The adjoining Pelican family restaurant is perfect for families of all ages. The hotel’s award winning spa offers an extensive treatment menu, as well as offering an indoor pool with whirlpools, a relaxation area and an Indian body and mind temple. The Amathus Herbal Experience is highly recommended. Children under the age of 16 are not allowed in the spa. Head to the neighbouring Four Seasons hotel and make the most of the many water sports available, including sailing, water skiing and more. Choose from activities including tennis and table tennis, with equipment and courts available on site. Group fitness classes are also held throughout the week. Live shows and music are performed on selected evenings and include international performances as well as offering an insight into Cypriot culture. 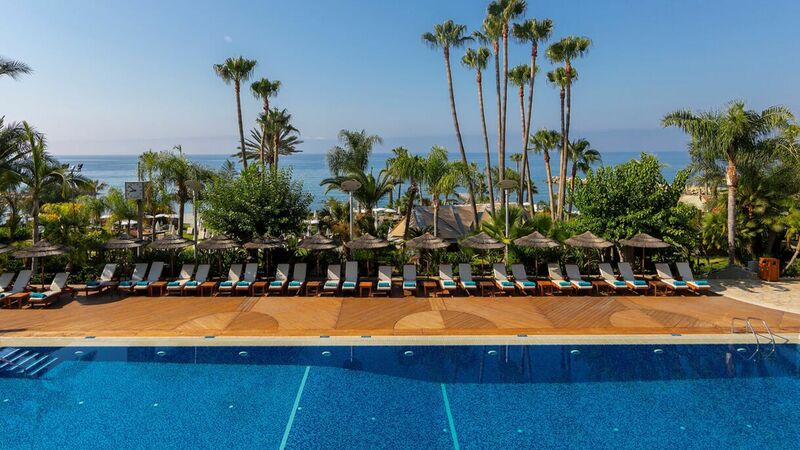 Found along Cyprus’ south coast, Amathus Beach Hotel is located in lively Limassol and is ideal for those wanting to enjoy the many amenities and activities available. 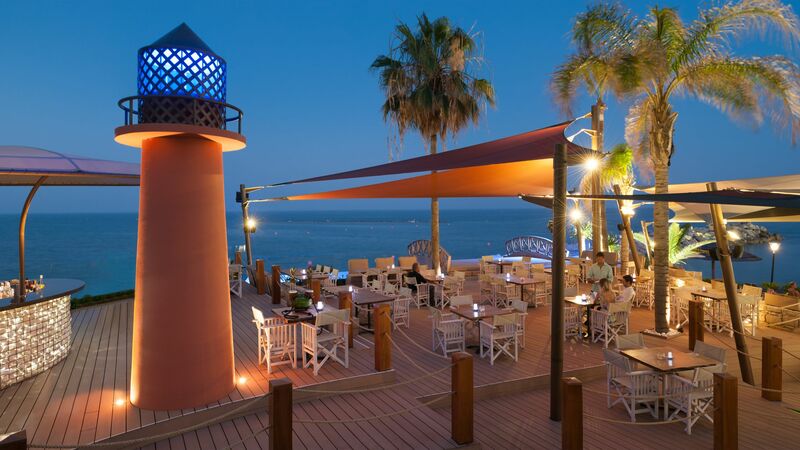 Limassol is Cyprus’ largest resort and offers a vibrant atmosphere for everyone. The beaches are fantastic and offer water sports, as well as a chance to relax, and little bars and restaurants where you can enjoy delicious local cuisine, cocktails and more. There are plenty of shops for those wanting to pick up souvenirs and unique gifts to take back home, as well as an old town for culture lovers. Take in the 19th Century architecture and pretty pavement cafés or wander around the castle and soak in its history. Amathus Beach Hotel is a 40 minute drive from Larnaca Airport. Superior Inland View Rooms are located on the 1st - 4th floors and have been newly renovated to offer contemporary accommodation with quality furnishings and stylish décor. The Superior Sea View Rooms have recently been refurbished, offering stunning panoramic views from their furnished balconies. These rooms are located on the 1st - 4th floors. Junior Suites with Sea View are located in the private annex and are elegantly decorated with a lounge area separated from the bedroom by a partition. The suite has a coffee machine, iPod docking station, marble bathroom with twin sinks and an expansive balcony with sea views. Two children between the age of 2 - 17 years staying in their own room will receive up to 10% discount between 01 November 2018 - 24 April 2019 (a minimum of 7 nights stays is required). Like some of the other reviews, I just don?? ?t know where to start. We?? ?ve stayed in some pretty nice hotels and the Amathus has risen to the top - and that?? ?s some achievement given the hotel is undergoing some renovation and not all restaurants were open. Firstly, the hospitality here is something else, if I could give it more than 5*, I would. 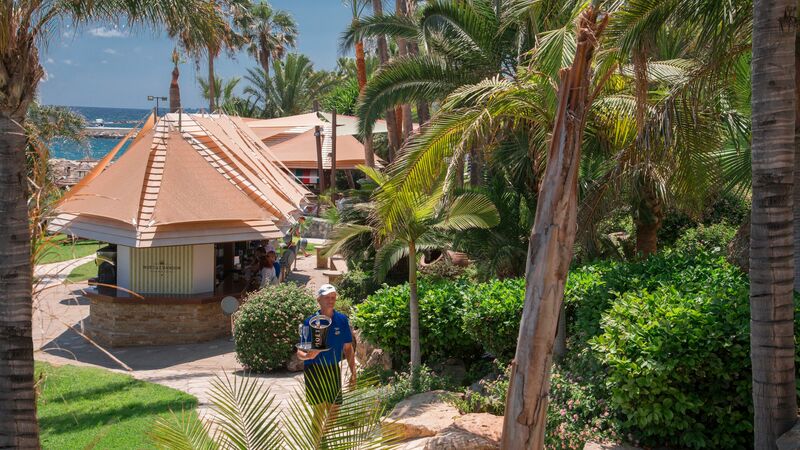 Every member of staff from reception, to the Kalypso restaurant, guest relations, the pool, housekeeping and everywhere in between could not have been more helpful, attentive and accommodating. They all make you feel like you are the most important guest in the hotel. Special mention to Andreas the hotel manager who made every effort to make you feel like royalty, nothing was too much to ask. Also to Anastasia who helped to make my little girls 6th birthday really special. The hotel itself is beautiful, extremely well kept, clean and modern, with an air of prestige to it. The rooms were spacious and also well kept and really clean (I have really tough standards on this, especially with bathrooms!!) The Kalypso restaurant - wow! The food was delicious and there was a lot of choice if you opted for the buffet option. I normally love to go out and experience local restaurants but did not have any urge to go outside of the hotel which is rare for us. They made everything so easy with our stay, especially with our 2 girls who are 6 (just!) and 1. We?? ?d love to come back again, the only downside I have is the weather was really up and down at this time of year! So I can only imagine how amazing this will be in the height of summer! Overall a very good holiday experience, from the moment we arrived the staff treated us with great hospitality and made us feel special. At check-in we got greeted by several staff members and this positive atmosphere continued throughout the week. We are a family of 4 ( kids 4 yr, 8 yr), and both kids loved spending time at the water slides and in the kids club. To put it in perspective, last year we stayed at another hotel in Spain and both kids did not want to attend kids club. I contribute the change to again positive staff members as well as the broad range of activities there. Also worth mentioning the lifeguards dedication to maintain high security for all kids playing at the pool. I like to workout when I'm on holiday and the gym at the hotel did not leave me disappointed, wide range of equipment including both machines and free weights, plenty of space and again very professional staff. Also great view facing poolside and ocean. We also enjoy SPA treatments when on holiday, and the deep-tissue message me and my wife enjoyed hit all points and made us go back for a second treatment. The treatment room as well as the relaxing space post-message meet the same high standard as the rest of the hotel. Also worth mentioning the service prior to us arriving was also very good, questions got answered within minutes or hours. Buffet restaurant also keep a very high standard with excellent staff, there is a small a la carte option available at the same restaurant but towards the end of the week you felt something was missing. Another restaurant just opened the day we left and I think there are additional restaurants opening later on in the season so might be less of an issue going forward. Also the Hotel have a partnership with Four Seasons next door that gives you a few more options including a very high end restaurant with great tasting menu. We would like to say Thank you to an amazing Duty Manager Myria Tryfonos she monitors guests satisfactions and she always approach with kind words and sweetness her smart mind set and hospitable skills she is truly the hotel's asset. This was our first time visit to Cyprus and it will not be our last, We will defiantly return to this hotel! Family Nilsson. Visiting this hotel for dinner is amazing especially through summer time!! The place is perfectly decorated and the food is excellent! Try their fish is great! Can be a bit expensive but it is worth it! “ They are not lying, it?? ?s wonderful! We are a family of 4 and have just left Amathus Beach :-( We all felt so sad to leave, the staff are out of this world! However they maintain their attention to detail I do not know, but they don?? ?t miss a thing! You really are treated like an honoured guest. The whole hotel is so clean, and food is generally excellent with so much choice on the buffet. I normally hate buffet food, but this feels professional and enticing. I love the hotel at night, lit up so beautifully! I have to thank the staff one last time as I?? ?m very shy, but because they are so kind and attentive I found it so much easier to ask for things I?? ?d normally not, which made me feel a freedom to relax in. We will return, we have to! “ Great for an Easter Break with Kids.